After-work Panel Debate: "Protecting posted workers – A contribution to free movement of persons in Europe?" The College of Europe Development Office, in cooperation with the Swiss Mission to the EU, organized an after-work panel debate on "Protecting posted workers – A contribution to free movement of persons in Europe?". The event took place at the Thon Hotel EU in Brussels on 14 November 2018 at 17:00, and was followed by a networking cocktail. In recent years the free movement of workers, one of the fundamental principles of the European Union, has become an increasingly polarized topic in public opinion. In the run-up to the Brexit-referendum, Brexit campaigners claimed the large number of EU workers in Britain were responsible for the downward pressure on British wages. These concerns have been shared in other EU Member States and have recently prompted the Juncker Commission to revise the Posted Workers Directive in order to protect European workers from social dumping. In a similar vein, Switzerland has a long experience in this field since its bilateral agreement with the EU on the free movement of persons entered into force in 2002 (AFMP). Switzerland introduced in 2004 flanking measures in order to protect the working conditions that apply to the specific situation of Switzerland, in conformity with the AFMP. New measures are being discussed on a regular basis. The panel debate therefore focused on whether these measures achieve their projected goal of protecting workers or whether they merely impede business? The event was opened by Mr Olivier COSTA, Director of Studies of the European Political and Governance Studies Department, who stressed the importance of the topic and expressed his gratitude for the fruitful cooperation between the Swiss Mission and the College of Europe. Mr Stephan LAUPER, Second Deputy Head of the Mission of Switzerland also emphasized the importance and the sensitivity of the topic for Switzerland especially given that the current Brexit negotiators are looking at the Swiss model to structure their relations with the EU. 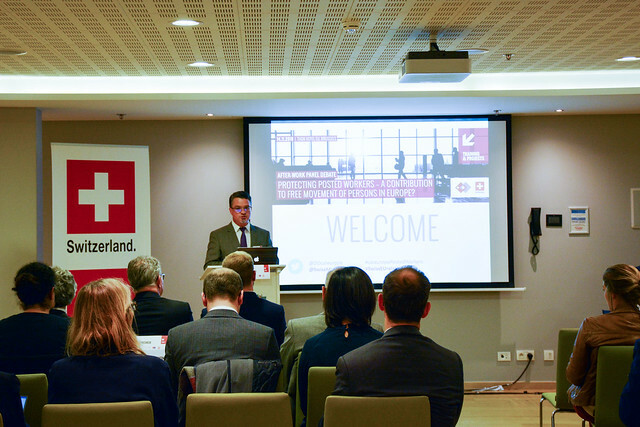 Mr Boris ZÜRCHER, Head of the Labour Directorate at the Swiss State Secretariat for Economic Affairs, provided a comprehensive overview of the current state of affairs in Switzerland during his key note speech. Mr ZÜRCHER stressed the large influx of posted workers Switzerland receives on a yearly basis which, without the implementation of flanking measures, could heavily disturb social protection and the Swiss economy. The keynote speech was followed by a short presentation on the point of view of each of our panellists. Mr Jesús BALLESTEROS, Director of the College of Europe’s Development Office, moderated the debate and opened the floor to Ms Kata TÜTTÖ, Member of the Budapest City Council and Member of the Committee of the Regions. Ms TÜTTÖ presented the challenge Bulgaria experiences; the country sends out a large number of posted workers resulting in a brain drain. Mr Federico PANCALDI, Policy Officer at DG Employment, referred to the amazing opportunities a single market provides to workers, allowing them to work across 28 different Member States. Nonetheless the European Union needs to provide sufficient protection to these workers when they become posted in another Member State, which is why the Commission invests so much effort in the protection of workers which only makes up 1% of the total labour force. This contribution was followed by Ms Liina CARR's, Confederal Secretary at the European Trade Union Confederation, who provided an insight in the negotiations on the Revision of the Posted Workers Directive and the goals of the European Trade Union Confederation. The panel debate was followed by a lively debate where both speakers and participants could raise their questions or remarks on the topic.